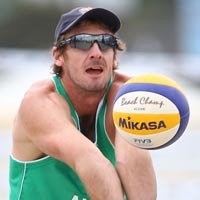 Nicknamed Beanie, McHugh placed ninth with Trent Irwin at the SWATCH-FIVB World Championships for players under the age of 19 at Myslowice, Poland. Most embarrassing moment? - Yet to come. What makes you interesting? - My life story. What frightens you? - My mother. What excites you? - Playing volleyball, prize money. If you could compete for Australia in another sport what would it be? - Lawn Bowls. Best bit about coming home after being away? - Mum's cooking, my bed. If you could meet anyone who would it be? - Glenn McGrath, because he is a champion of his sport.